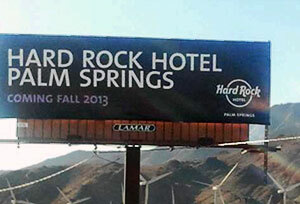 Billboards tout the 2013 opening of Hard Rock International's 177th globally recognized venues in 58 countries. With 160 rooms, Hard Rock Hotel Palm Springs will be located in the property now operating as Hotel Zoso. The billboards play to Hard Rock's musical roots, while taking a cue from Palm Springs' rich music traditions, like the Coachella and Stagecoach music festivals. Advertisers might call it rock eye-candy for Coachella. Heineken. Hudson. Hawaiian-made Olukai flip-flops. The Hard Rock Hotel. Forever 21. Sanuk sandals for Backyards, Beers & BBQ. All those labels — plus eight Universal Republic billboards of artists playing Coachella from James Blake and Ben Howard to Ghost B.C., and two recording giants set for new album debuts, Black Sabbath and Kid Cudi — have transformed a rocky, wind-blown stretch of desert into a marketing oasis. With Goldenvoice organizers locking Coachella Fest into the equation through 2030, advertisers are already staking out their claim in the frontier. Forever 21 took a front and center-fold position in the desert along the I-10 corridor and a digital billboard along Highway 111 in the heart of Greater Palm Springs. Billboard occupancy is up 12 to15 percent over last year, Houck said. The vibe is noticeably different. Golf club businesses, spas, restaurants, Indian casino acts, retailers in the Cabazon outlets and public service announcements by not-for-profit agencies had been the mainstream ads dominating the Lamar, CBS Outdoor and Empire billboard spots until now. The Coachella-themed playbook has been packed with short-term marketing opportunities for the sleepy backwater of advertising for national brands in the genre of alcohol, clothing, music, hipster resorts, nightclubs and gigs from here to Las Vegas and Phoenix and LA. Movie-makers have gravitated to the San Gorgonio Pass from Banning to the Coachella Valley, as well. What’s created this sea change as motorists approach the valley floor? Tourism is up. The traffic counts are, too. Discretionary spending is loosening somewhat. Decades-long hospitality executive Aftab Dada, general manager of the Palm Springs Hilton, said the 17-year lock on the festival has given advertisers and vendors heightened confidence in laying out bigger marketing plans. Karen Post, national branding expert and author of “Brand Turnaround,” said billboards — like all media — impose charges based on the number of eyeballs that are exposed to the image. If national brands are gravitating there, Post said it is probable that the Coachella fest has accumulated enough consumer research to tell them an ad placement there is warranted. “The priciest boards in the nation are in high-traffic areas like LA.,’’ she said. Donald Perry, a former Clear Channel TV executive, said billboards have incredible advertising value. Traffic counts cited by San Bernardino Associated Governments note 204,000 to 237,000 vehicles daily on the stretch of I-10 to the mouth of the Coachella Valley. Jonas Udcoff, CEO of Cord Media, a Palm Desert communications firm with clients in the hospitality businesses, homebuilders and Indian casino businesses, said three billboards were purchased along the I-10 corridor to announce the fall 2013 debut of Hard Rock Hotel in Palm Springs. “We backed them up a bit to the time of the Humana and the BNP Paribas events,’’ he said, placed with a primary goal to capture the audience for Coachella and Stagecoach. For Stagecoach Music Festival, which follows Coachella, Cord keyed in on Spotlight 29 Casino’s booked act for American country music singer and "American Idol" winner Scott McCreery. With 80,000 people per weekend coming through — primarily out of Los Angeles, San Diego or Orange counties — you have an influx of people who are not normally coming in the desert that you don’t normally advertise to, Udcoff said. Republic, a division of Universal Music Group, which nabbed five more music artist billboards for Coachella 2013 than it did in 2012 when it wrapped vinyl on three boards along the I-10, said this mode of advertising doesn’t only make sense as a consumer tactic. Jim Roppo, executive vice president of marketing for Republic, told Billboard.com that it conveys a strong message to industry peers. “It’s a way to convey to the industry community what we’re doing at Republic — to managers and film companies in a B-to-B way,’’ he said. Were it not for the tough economy in the region, this might also become a prime time to capitalize on rates. Although premium prices are paid for the short-flight ads, Houck said billboard prices in the Inland region — while not disclosed by any of the billboard companies — still are below what might otherwise be commanded in major metro areas of Los Angeles or the San Francisco Bay. Occupancy has grown 12 percent in the last year, Houck said. The original article appeared on The Press-Enterprise's website. In support of the Child Advocacy Center, Lamar Advertising announced that they'll be donating space on ten billboards in the Mobile area with one simple message: report the abuse.